Vote and become eligible for discounts. Wow this is really interesting and a great way to motivate voters. As we know general elections are nearby and every single effort to motivate people is respectable. And as we know discounts, offers and sales lure people to the core. And when your vote can bring savings on your shopping even those who don't have time to vote or are just lazy will go out and vote. Vote and Save big on your online shopping is Quite an innovative concept which i came through official blog of buyapparel.in this afternoon. Probably they are the first eCommerce shopping site to do this as after searching on Google i cannot find any single website which has such innovative offering. Buy Apparel is one of the best online shopping website for Indian women as they specialize in Indian ethnic clothing for women - Sarees, Suits, Lehengas and Kurtis. They are the people with difference. Always up with best prices and services. So what the offer is all about? These elections lets vote for better India. Vote For India. Vote yourself, show the world that you voted (taking part in such offers is optional but this is certainly a great idea to show the world that you voted) and ask your friends and family members to vote. Right from the day we started fighting for an Independent India there had been a vision about Dream India..! Dream India - The India it should be was envisioned by many patriots like shaheed e azam Bhagat Singh ji and Mahatma Gandhi ji. But It has been long way and most things are still under achieved. One of the basic point of Gandhi's vision on swaraj was "Organizing the society and economy of free India in such a way that the basic needs (food, clothing, shelter, health, education, security, and self-esteem) of all were met satisfactorily and on a priority basis)" is still a long way to go...! Though we have strive in many fields and have been successful in fighting against diseases like Polio, Leading the IT industry, India's Space missions, and so...! But many of Indians are still not able to meet the basics of life and even necessity is not met. Water, Food, Shelter and Sanitation remains the struggle for common man...! And there are very few efforts by government which can be appreciated. Many policies were made but not implemented. It all remained a vote bank politics. Britishers left the country long back.. but they left the legacy behind - Divide and Rule...! Literally most political parties have a divided segment of population for votes...! Some divides us we Indians based on Religion, Some on Castes. Selective Division of People and Selective Unity for votes has been the rule to be in power may it be any political party. And once in power selective policies for the selective group of people for the selective growth has been implemented this has resulted into many issues. 1. Reservations - Reservations has been the golden rule of dividing the society as selective vote banks. The policy of development of people based on caste has been chosen and implemented not based on economy. Selective Caste based division for Education, Jobs, And even promotions and special recruitment drives still keeps people reminded of which caste they belong too. Probably a child in city learns first time what caste is while he completes his high school. Some people are taught by the society and some are taught by the systems. This keeps India Divided. The policy is not completely worth condemning. It has done many good things for the people who have been neglected, under-estimated and dishonoured. But somehow in today's date it is not meeting the demand of the changing India. Hence it needs to be modified. The policy is of benefit to the riches of targeted audience but somehow cannot meet the expectations of even poor of the targeted castes. There are many people from SC, ST, OBC who still remains in poverty and benefits have not yet reached to them which was supposed to be. Where as this selective policy has caused trouble to open caste and they face difficulties in completing their education. A 90% scorer of open caste cannot meet his dream to be a doctor where as an ST candidate of 55% can. Similarly in other trades like Engineering. Result is not so qualified doctors and engineers and other professionals. And there is no hope for poor open caste people as they have no help from government. So this policy should be changed and thought over again considering the development of all. The policy should be such that it does not divides people and offers growth to all. My suggestion is that there should be no reservation in Jobs and promotions and education. And no compromise on Seats as well. No compromise on merits and talent as well. There are many reserved free seats in many colleges. These should be increased and even private schools, colleges must be forced to have atleast 10 percent seats reserved for the poor. And a government body to be enacted which will fill these seats based on economy conditions of the applicant without compromising the merits. Independent India have quite good laws to ensure rights of every citizen but somehow they are not implemented properly. The criminals are not punished and at times police just accuse somebody wrongly and punish it. Still after 66 years of independence women safety remains an issue and in fact crimes are growing. There is a need of bringing fast track courts, increasing the number of judicial bodies, increasing the number of courts and hearing capacity, increasing the number of high courts as well. We can surely have more then one highcourt in more then one city of a state. We can surely have four supreme courts, one in north, one in west, one in south and one in east. And Above all remains the president as in current scenario. Why we must remain conservative that there must be only one high court in a state and only one supreme court in a country? Most policies have been drafted thinking the higher class, the poors have been always ignored or not considered. May it be related to healths, justice or food and shelter. I will try to explain with a simple example. Say there are how many trains which connects metro's like Delhi - Mumbai and have AC coaches and is a superfast train? Most people will say common AC train is aught to be super fast and you have a big list. Now i ask there are how many super fast passenger trains? What super fast passenger trains?? Passenger trains and Fast? Is there a single train which has all general coaches and is a super-fast train between any metro? The answer is most probably No. At least upto best of mine information there is no such train. When there is a huge rush in general coaches, why such things are not planned and implemented? Is the railways only for a certain class of people? Does the time value of a poor is less? Why there can't be a super fast train with all general coaches? When it comes to make policies for poor there is a lag. They are just drafted in air. Sanitation, Food and Health, Safety, Shelter, Proper Education still remains the basic requirements for most Indians after so many years of independence. We really need to think and drive the nation to right direction. Our wrong policies are becoming one of the biggest hurdles. The talent is fleeing out of the nation because of reservations, and improper laws and corruptions. Poors are not getting enough opportunities to move ahead. And the middle class is struggling hard against the odds like inflation. Economic stability remains a concern...! A friend of mine who got his heart broken on this Valentine's Day... These lines are written for him on request...! 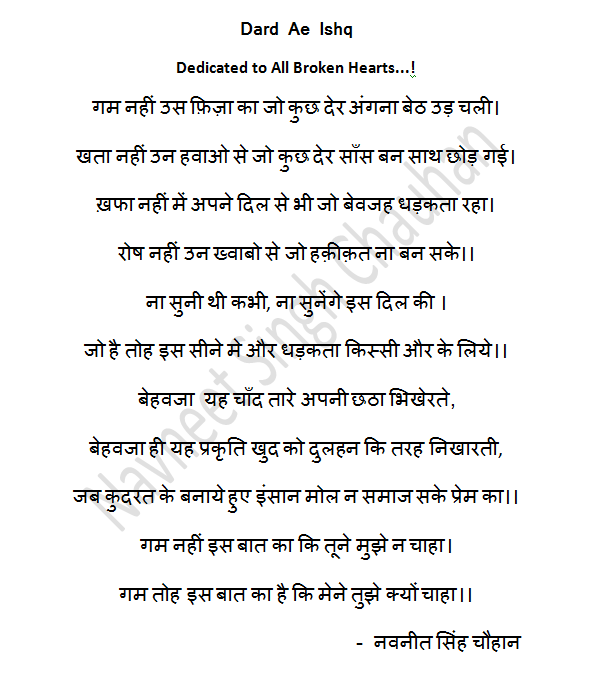 Poem is in Hindi...!